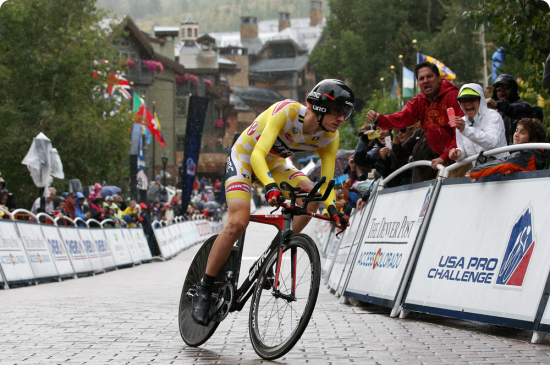 Tejay van Garderen of BMC Racing is now the two-time defending champion of the USA Pro Challenge (USAPC photo). Aspen’s Tejay van Garderen took over the lead on Monarch Mountain, built a big cushion with another record-breaking performance on Vail Pass and cruised to his second straight USA Pro Challenge overall victory in a triumphant final stage from Boulder to Denver on Sunday. The BMC Racing star was sixth on the day behind Garmin-Sharp’s Alex Howe, who threw his bike over the line for a photo-finish win over Kiel Reijnen (UnitedHealthcare) — making it a 1-2 finish for Colorado cyclists. Van Garderen once again praised the massive crowds that turned out for the fourth running of the seven-stage Colorado race. “It was incredible,” van Garderen said of Sunday’s 78-mile Stage 7. “The crowds were huge in Boulder, and it was just like a big crescendo coming into Denver. The crowds just got bigger and louder, and it just felt awesome. Garmin-Sharp’s Tom Danielson finished in the pack and wound up second overall (1:32 back) after claiming third last year. Serghei Tvetcov (Jelly Belly) finished third in the final GC and was 1:46 off van Garderen’s pace. German rider Jens Voigt of Trek Factory Racing was part of an early break that dwindled to five riders over Lookout Mountain, and the crowd favorite managed to hold the lead until the final lap in Denver, where the peleton caught him and many riders patted him on the back on their way by. It was Voigt’s final professional race. Howes, who grew up in Golden and now lives in Spain, was ecstatic to win in front of hometown fans. Van Garderen seemed almost as pleased to help win the team title for BMC. Van Garderen, winner of two stages himself, tried to help teammate Michael Schär win a third by leading him through the final corner of the 126.2-kilometer race into Denver. But Schär was unable to hold off Alex Howes and Schär finished third, earning the BMC Racing Team its sixth podium finish of the race. Van Garderen’s victory was his fourth of the season and the BMC Racing Team’s 25th this year. He also won the “best Colorado rider” classification ahead of 12 other residents of the state. The day started with a symbolic appearance on the start line by injured BMC Racing Team rider and reigning U.S. national time trial champion Taylor Phinney, who lives in Boulder, site of the stage start. From there, the BMC Racing Team worked to keep a breakaway in check before bringing the race back together inside the final kilometers. Schär, who soloed to win a stage of the Larry H. Miller Tour of Utah earlier this month, thought he had another one in his sights. BMC Racing Team Sport Director Jackson Stewart said he could not have imagined the race going much better.